DR NICK HAS THE NACK! Fill out our simple online form to request your free estimate. From high-tech repairs to general maintenance, we do it all. Dr. Nick’s Transmissions – has the nack! The transmission in your car is one of the most important parts to keep running smoothly. There are various reasons for this, but the cost is at the top of the list. Minor repairs and maintenance on a transmission are not going to break the bank, but the cost of completely replacing a transmission can be very expensive. Here at Dr. Nick’s Transmissions, we are experts in diagnosing, repairing, and rebuilding transmissions. Give us a call today at 631-751-6500 for your transmission repair needs! 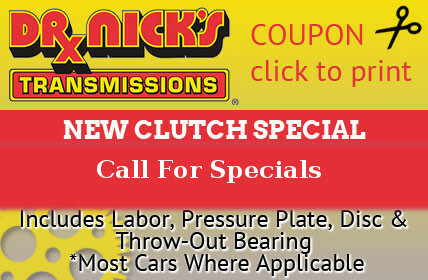 Dr. Nick’s Transmissions is an independently owned and operated franchise location. With more than 45 years of experience in the transmission repair industry, customers have come to realize that Dr. Nick’s Transmissions is more than qualified to repair and maintain your vehicle. Our service center is proud to be able to offer a nationwide warranty, which is honored by all of our service centers, no matter where you are. If you like to travel and take road trips, this will be a huge plus to you if anything goes wrong on the road. With our many years of experience in the transmission repair business, we are often considered to be the best at repairing and maintaining transmission systems and drive train components. If you are wondering how we have attained this reputation, it is through excellent customer service, attention to detail, and high-quality work. You deserve nothing less, and therefore should expect a certain level of quality that we can deliver. If you are unsure about the costs of repairs, our mechanics offer free estimates and financing options. 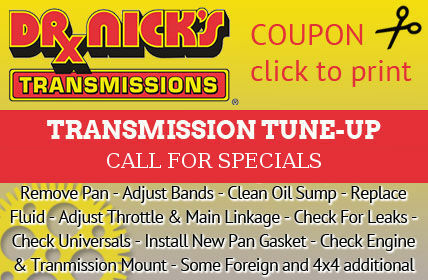 For all your transmission repair needs, contact Dr. Nick’s Transmissions by calling 631-751-6500!